Food fads—they come and go. Some, like bone broth, need to go yesterday. What is bone broth, anyway, and does it work? Read on to find out, and learn about vegan collagen supplements that aren’t revolting and actually work. Bone broth is made from living beings’ bones, skin, cartilage, ligaments, and tendons—these usually come from slaughtered cows or chickens but also come from ducks, bison, turkeys, lambs, deer, and other animals. Consuming it is no less cruel or repulsive than eating a burger made of turkey flesh or sporting a jacket made of rotting cow skin. The bones used to make it come from sensitive, intelligent animals who are killed for food—the same ones who are crammed by the thousands into filthy, windowless sheds and stuffed into wire cages, metal crates, and other torturous enclosures and endure constant fear and torment. Chickens who are slaughtered for food, for example, spend their lives in dirty, warehouse-like structures—from the moment they hatch until the day they’re killed. Yes, that includes most of those on so-called “free-range” and organic farms. Every bit of flesh that you buy as “beef” in a grocery store comes from a sensitive cow who was branded, dehorned, and castrated—all without painkillers. No matter what ridiculous marketing terms items are labeled with—for example, “grass-fed,” “grass-finished,” “free-range,” or “humane”— all cows used for food end up in slaughterhouses, where workers shoot them in the head with a captive-bolt gun, hang them by one leg, and cut their throats before skinning and gutting them. 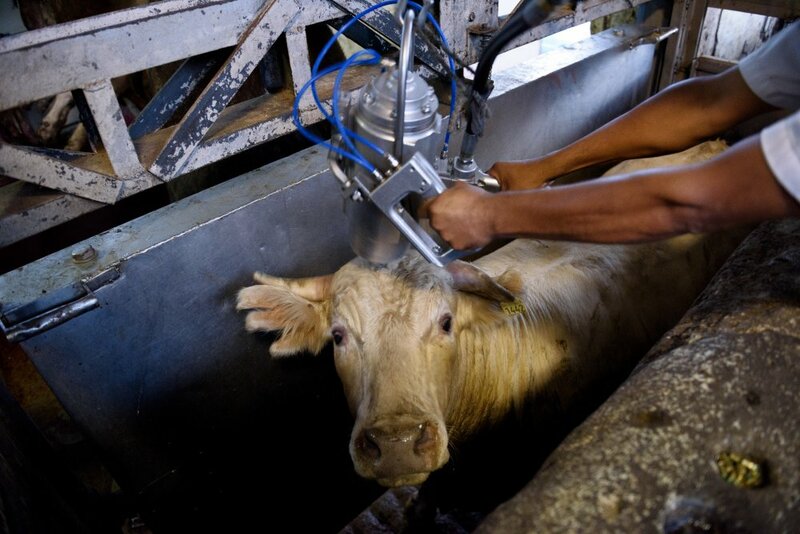 Some cows remain conscious throughout the entire process. If you buy bone broth, you may pay an outrageous amount for something that is essentially just stock, but animals pay with their lives—just so that you can drink steaming mugs of death. What About the Supposed Health Benefits of Bone Broth? “Eating a diet rich in leafy green vegetables is ideal. Plants offer richer sources in collagen building blocks and, in addition, provide nutrients not found in sufficient quantities in meats or broth,” she says. “Scientists agree that bone broth’s so-called ability to heal and restore collagen is probably overblown,” according to chef and food journalist Amy Blaszyk. Collagen is in our bones, muscles, tendons, skin, blood vessels, and digestive systems, but as we age, we produce less of it. In addition to eating veggies, taking vegan collagen supplements can help keep all these body parts (and animals) healthy. For a tablet version, try mykind Organics Plant Collagen Builder—co-developed by vegan actor Alicia Silverstone. If you’re after younger-looking skin, click here to discover how to fight wrinkles the cruelty-free way. Tummy troubles? You don’t need to drink animal-bone soup to combat poor digestion. By simply eating a high-fiber diet, you can improve the functionality of your gut, and most fibrous foods are vegan. Think avocados, raspberries, artichokes, lentils, oats, and chia seeds. Make sure that you stock up on veggie broth, too. You can also add vegan foods that contain probiotics—like kombucha, sauerkraut, and miso—to your diet, which promotes a healthy digestive tract and immune system. For a digestive supplement, consider trying one from PETA Business Friend Deva Nutrition. You can eat your way to healthier joints, one berry at a time. Many vegan foods—including berries, nuts, orange veggies, and dark leafy greens—contain antioxidants and anti-inflammatory compounds that can effectively reduce joint stiffness and pain. Some people who suffer from arthritis, like Patrice Herbst and Jon Hinds, even assert that going vegan helped them combat their symptoms. For added joint health, consider taking bone and glucosamine supplements from Deva Nutrition. While vegan collagen supplements can help you to have healthier hair, skin that glows, and stronger nails, there’s more that you can do to protect yourself from damage. Consider taking a vegan biotin supplement or a hair, skin, and nails supplement like those offered by Deva Nutrition. And if you aren’t already vegan, give it a try: Going vegan can help improve your skin—and save animals. Forget flimflam fads. All you need to restore collagen and live your healthiest, kindest life is a well-balanced vegan diet. Let animals keep their bones while you keep yours healthy. Click here to learn more about the benefits of being vegan, and find out how to get started on your vegan journey today.